Over recent months few people can have missed the bizarre rigmarole UK Ministers got themselves into about the so-called ‘Brexit impact assessments’. First they were a work in progress, then they existed in “excruciating detail”, then they were a mere summary, then they didn’t exist at all. Then they did exist again and were fine, really fine. Everything was absolutely marvellous and the research confirmed all the upbeat Moggist enthusiasm about cheap shoes and Empire 2.0. However as well as confirming this rosy picture they were also utterly hush-hush and could completely undermine the UK’s position if they got out, so much so that nobody was to be allowed to see them. This week however MSPs finally got a half decent chance to take a look at these fabled scrolls. It came after calls from both Parliaments for Ministers to come clean, after which they grudgingly arranged for limited access under conditions that felt like something from a 19th century spy story. The story’s first chapter was, I have to say, a bit of a shambles. In the week before the February recess Robin Walker, a Minister in DExEU (the government department with the most improbable acronym outside of The Thick of It), wrote to MSPs offering a few fixed time slots for us to view the Brexit papers. The first of these sessions ended at 1pm on the Wednesday, which was precisely the time when his letter informing us arrived in MSPs’ inboxes, so I should imagine the take-up for that session was on the low side. A small number of MSPs were able, in the end, to rearrange their diaries at almost zero notice to hare across to the Scotland Office on the other side of Edinburgh, to take a look at what was on offer. You can imagine their bafflement when the officials proudly presented the even numbered pages only. Yes folks, meet the UK Government: the people in charge of the most complex and challenging constitutional change for generations, but who cannot figure out how double sided printing works. In the end even Mr Walker had to admit that the situation was a mess, and he agreed to make the documents available again, for longer, and actually inside the Scottish Parliament. Which is how I found myself heading to the Donald Dewar reading room at Holyrood on Thursday this week, for my long awaited chance to catch a glimpse of information so incendiary that the public must be protected from any hint of its contents. Not only must the public be protected, but MSPs were also to be prevented from taking any accurate record of what we were being shown. A special box was provided for us to deposit our phones, tablets and any other devices. Handwritten notes only. Provide your own quill and vellum. One colleague had properly anticipated this – Green MSP Mark Ruskell brought tracing paper with him, and managed to use it to copy some of the graphs showing the likely economic wreckage the Brexit crisis will cause. The UK Government officials seemed momentarily confused, being of an age perhaps to have never seen this antique technology before. But hey, what he was copying out was still handwritten, so he got away with it. The ludicrous anxiety the UK Government has displayed over this incident would be laughable if it didn’t also betray something very serious. There actually wasn’t much in the documents that we don’t already know – every economic assessment of the consequences of Brexit is negative, except for the hard right ideological ravings of Patrick Minford and his ‘Economists for Free Trade’ group. Under all scenarios, from the hardest of hard Brexits to staying inside the single market via the European Economic Area, our economy will suffer. Scotland won’t be the hardest hit area, but will fare much worse than areas like London and the south of England. The only opportunities to gain economic benefit from ‘taking back control’ will come from breaking government promises about social and environmental regulations, and fully embracing the dystopian future David Davis promises won’t happen. The truth is that the UK Government fully understand the reality of this, and are desperate to deny that this is their own conclusion. The UK currently has a Government that’s willing to devastate the economy to satisfy the whims of the Brexit Ultras who have taken them over, and a main Opposition party that’s unwilling to call out this insanity and demand a change of course. It is still not too late to call a halt to Brexit. Ministers can no longer hide the truth of the crisis they have created, and those who just keep driving us over the cliff will deserve the contempt of the country, for generations to come. However, is this ongoing Brexit farce good or bad for indy prospects? Maybe the disengaged will be vaguely aware all is not well with the world so best not to risk piling on more uncertainty that is bound to follow indy. SNP really does need to nail currency, pensions and defence this side of the summer. The social stuff and fiddling with marginal tax rates is all very worthy but in my view does not cut the mustard for indyref2. Brexit is uncertainty taken to the nth degree. Partnership in the EEC/EU has been our status quo for the past 45 years. Ergo, Independence would be an avenue to maintaining that status quo. The idea that we should remain tied to a state willing to sacrifice all our futures for the fool’s gold of “Global Britain” is where all our uncertainty truly lies. Not sure myself Clive. Bloody difficult to know whats best these days. All so damn complicated. One things for sure, its going to end a fine mess. Always does if that buffoon Salmond has a say. Never trusted the tilt of that mans jib. Too damn smug for my liking. I heard it from a good source (no names no pack drill) he’s damn slow when it comes to his round. Forgive a man anything but christ, cant believe he’s that bad. Anyway, back to Indyref2. Remind me again what was the result of Indyref1? How did that go again? I still have my lapel badge in the dresser drawer. Good times. As for Brexit, I don’t know about you but I think its the best show Ive seen, since, well since, since ages ago. Have you seen that comedian, cant remember his bloody name now, never off the box, always banging on about how ‘Bwexit will be a catastwophy’ and how we must have a ‘second weferwendum’, bloody hilarious. Is that the one you mean, Clive? Was there mention of the UN Sustainable Development Goals, or is the plan to leave the United Nations as well? 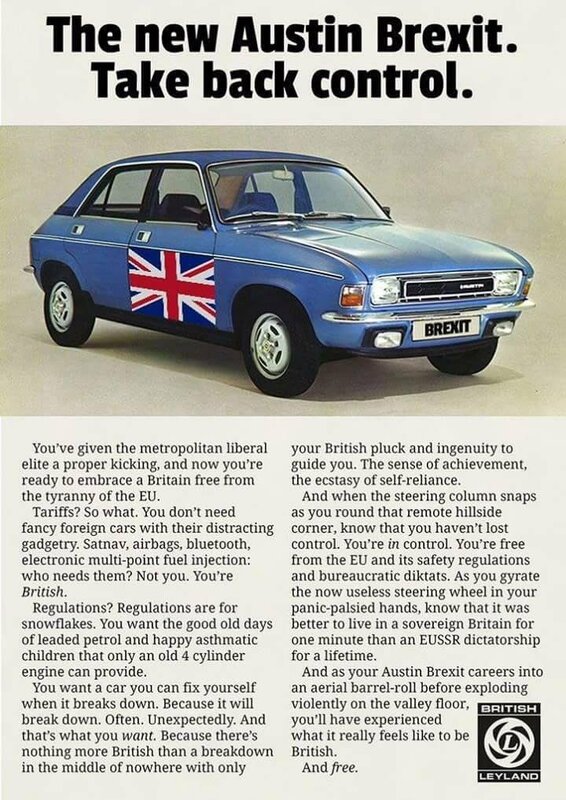 At least when the Allegro was being manufactured the UK had a raft of state owned industries. British Airways, British Steel, British Airports Authority, British Motor Corporation – Leyland, British Telecom, British Gas, British Coal Board, the Water Companies ( in England ) British Rail and much more. And the point of the Allegro, with as I recall, the quartic steering wheel?